The economy is weak and you may have less money to spend, but great bags should hopefully never be out of our reach. If you're a patient person, it would certainly be wise to save your money over an extended period of time to purchase a high-end designer bag. However, if owning a Chanel or Louis Vuitton doesn't rank high on your list of priorities these days, then a stylish and practical bag like the MARC by Marc Jacobs Totally Turnlock Faridah Hobo will appeal to you. This is a fabulous bag that really delivers. The supple, cream leather and silver-tone hardware are a beautiful match that'll work well at any time of the year, even winter. It measures 13 x 14.5 x 6 but feels larger. 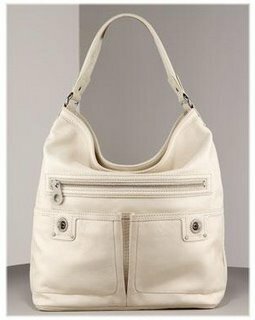 The large front zip and patch pockets with turnlock closure are the bag's selling points. They offer quick, convenient places to store items you need immediate access to. I have the Faridah Hobo (with flap, not patch pockets), and I love, love, love it. It's one of my favorite 'everyday' bags, and I receive lots of compliments when I'm out running errands with it. The hobo is a fun style with no frills and no fuss so you can't go wrong when buying one. Plus the 'Faridah' is priced below $500 so you don't need to feel guilty about looking so chic.